Congestion charging has averted what would likely have been a precipitous fall in London travel speeds over the past 15 years, according to my analysis of mode-share data from Transport for London, the government agency responsible for that city’s transport system. With a population equal to New York City’s 8.5 million and a central business district the same size as Manhattan’s, London’s congestion charging scheme has been a natural template for New York since its inception in early 2003. Indeed, its success in cutting car volumes and shortening commutes inspired Mayor Bloomberg’s 2007-08 congestion pricing initiative. Now, however, reports that London travel speeds have reverted to their pre-charging norm have bred misgivings that Governor Andrew Cuomo’s pending congestion pricing plan is intended solely as a revenue-raiser and not as an antidote to worsening gridlock. If the number of entering autos hadn’t changed, central London traffic speeds would be more than 20 percent below their 2002 levels, according to my modeling. And if the number of autos had risen in proportion to the expanding numbers of people entering the charging zone — a reasonable assumption in the absence of congestion charging — the decline in traffic speeds would have been a calamitous 32 percent. It’s true that these assertions are counterfactuals — might-have-been’s standing in for actual events. But while we can’t know exactly how London streets would be different today if automobile entries had stayed the same or grown — we can infer, and quantify, what might have happened. I assumed that prior to congestion charging, cars driven into the charging zone accounted for a third of miles traveled there, with in-zone autos and commercial vehicles (vans, trucks, taxicabs) responsible for the remainder. Assuming those modes have held constant, the 43.8 percent decrease in automobile entries equates to a 14.6 percent decline in overall in-zone vehicular travel. Anecdotal but widespread evidence suggests that central London travel speeds in 2015 were the same as in 2002. For that to happen, motor vehicle capacity would have had to decline in tandem with the 14-15 percent drop in traffic volumes; that shrinkage jibes with London’s addition of bus lanes, bike lanes, public plazas, and civil works like pedestrianized streets. The first counterfactual question then becomes: how far would London travel speeds have dropped if road capacity shrank by 14-15 percent while traffic volumes stayed the same? The “speed-volume” equation in my BTA spreadsheet model can answer that question for Manhattan (see instructions at end): It predicts a 22 percent drop in CBD vehicle speeds. The second counterfactual is the same as the first except that traffic volumes rise by 7-8 percent (or one-third of the 23 percent overall increase in the number of people traveling to the charging zone) while motor vehicle capacity shrinks. The BTA equation yields a 32 percent decrease in vehicle speeds. Depending upon the scenario chosen, then, if not for congestion charging, central London travel speeds would now be at least one-fifth and perhaps one-third slower. In New York, the direct costs in lost time from such a slowdown would be on the order of a billion dollars a year. London, a city as wealthy as New York, would have been saddled with similar costs. Are motor vehicles moving faster in the heart of London today than they did before congestion charging? Evidently not. But the combination of charging with reconfigured road space and transit expansion has enabled London to absorb more than a 20 percent increase in central London commuting, without skipping a beat. That’s no small feat. 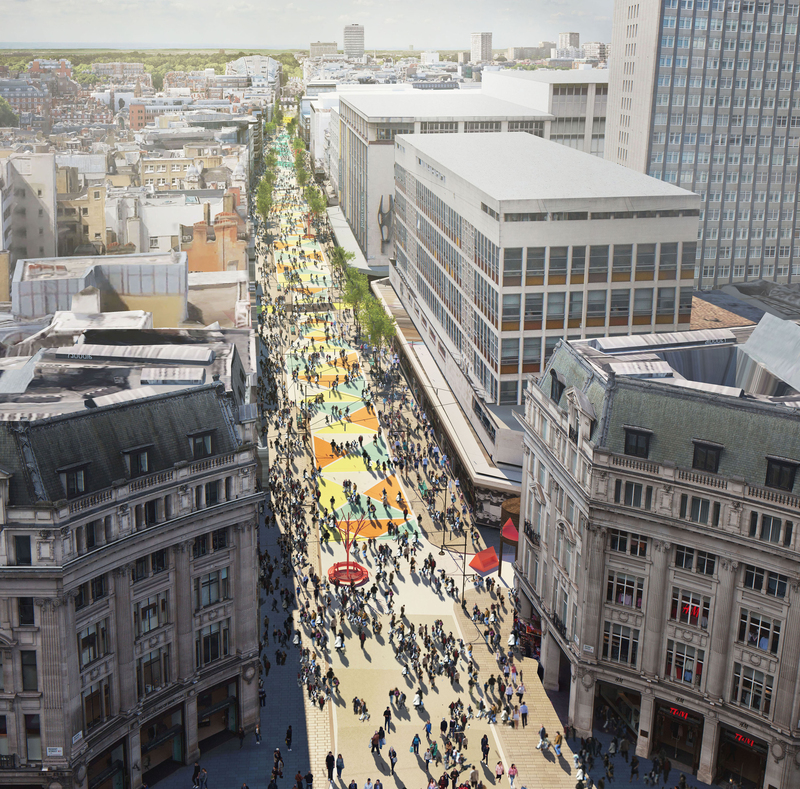 London Mayor Sadiq Khan plans to pedestrianize Oxford Street in 2018. To see calculations: Download the BTA spreadsheet (xls). In Results tab, use pull-down menu attached to Cell I25 to switch to Baseline scenario. In User Inputs tab, set Cell 162 (street space repurposed from autos) to 132 lane-miles (that’s 14.6 percent of the CBD’s 907 lane-miles). Now, back in Results, see that the big blue box at Cell B13 shows a change in travel speed of negative 21.6 percent. (That finding takes into account that some car trips that have lost their utility for their drivers would disappear.) Procedure for second analysis with assumed 7-8 percent rise in volume is same except that effective decrease in road capacity would have been 22 percent, or 200 lane-miles. Inputting that in User Inputs yields a negative 32.4 percent change in travel speeds. Note that the BTA changes continually w/ new data, so results at a later date may vary. I wonder if the service workers taking the Tube from “workers’ housing” fringe London face the same crime issues during late night hours as one would find in NYC ?? Also London has no version of New Jersey autos entering the City and not paying road taxes to support their use of City streets. Great article Charles, I grew up in London and you could get out of the car and walk faster than the vehicles – except you couldn’t breathe well enought to walk fast! Congestion pricing, and infrastructural changes have made the city much more livable. As someone who’s lived in both London and New York, I can testify that crime in London is markedly lower than in New York. The underground system certainly doesn’t have the same reputation as a haven for crime as the New York subway does. But, of course, the London Underground doesn’t generally operate all night, although some lines have recently started to do so on Friday and Saturday nights. As for the New Jersey autos issue, it’s true that there’s no direct equivalent. UK fuel taxes all go to central government. But a big part of the congestion charge’s success has been to divert drivers that would have gone through the congestion charge zone to drive around it instead. In New York, the equivalent would be the drivers that drive into lower Manhattan from outer Brooklyn to reach New Jersey in order to avoid the tolls on the Verrazano Narrows Bridge. A charge in lower Manhattan would send a lot of those people on more rational routes. This is a very good piece by Charles. As some readers will know from my previous posts, I lived in New York for four years until last year. I was also, however, the Financial Times’ transport correspondent for nine years running up to 2012 and had another stint in the job for nine months after coming back from New York. So I feel, having looked at London’s congestion issues a lot and knowing New York well, that I know a certain amount about this. 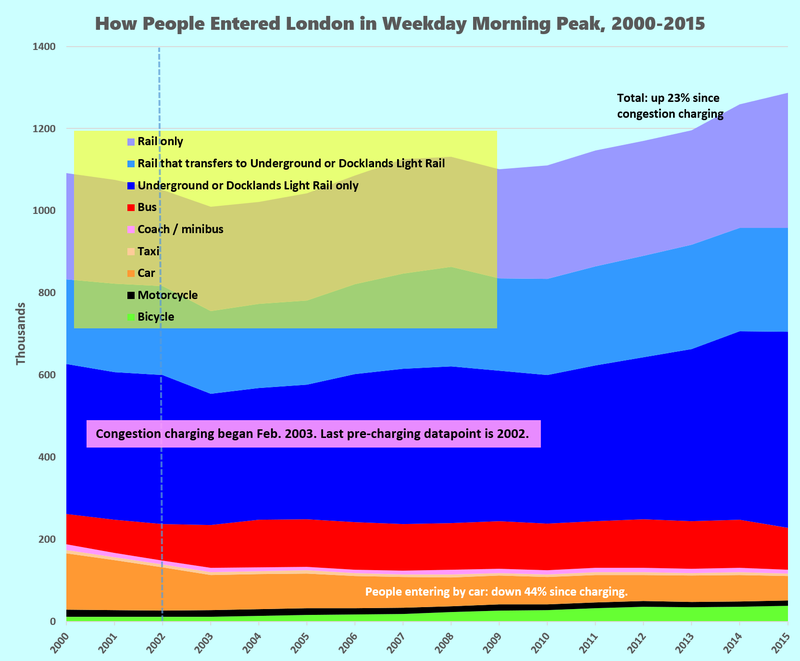 The London congestion charge had a huge effect on congestion when it was initially introduced – traffic volumes fell 15 per cent and congestion fell 30 per cent. It’s true that congestion has returned since. But, as Charles notes, that’s not because the congestion charge has stopped working. For a long time, Transport for London gradually took away road space from general motor vehicles to put in new bus lanes and cycle facilities and to create new pedestrian spaces. There have also been big spurts of activity that have taken away road space for other reasons. There was a big program of sewer replacement, for example, and the Crossrail project is currently disrupting traffic a lot in the center of London. There is no doubt that the disruption from that building activity would have been far, far worse without the congestion charge. The process has unfortunately (in my view) become rather less smooth recently because Transport for London has put in some big segregated cycle facilities without doing anything more to drive away traffic. That’s even though private cars now account for only about 18 per cent of traffic in the congestion-charging zone. The taxis, private-hire vehicles, vans and trucks that make up the traffic now are far less deterred by congestion than drivers in private vehicles. So congestion has gone up again for motor vehicles, on a network that has a far smaller capacity than it used to have. For New York, though, the main point is that congestion charging could work better than in London. Because Manhattan’s an island, unlike central London, it’s far easier to organize a congestion-charging area. New York won’t have the problem of drivers’ going just around the outside of the zone. There are all kinds of wasteful trips through lower Manhattan that could be diverted. New York should go ahead with charging as soon as possible.